The stimulus package passed for the year 2009 pumps $19 billion into the medical industry to help implement technology that makes healthcare safer and more connected. 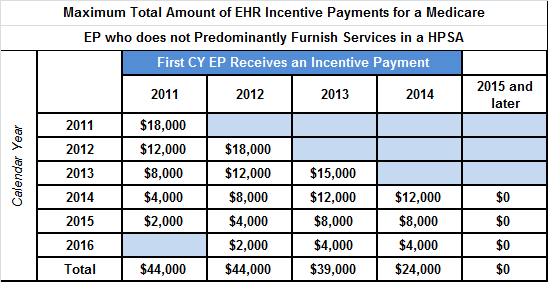 Those who prove meaningful use of Electronic Health Records can receive an incentive reimbursement of up to $64,000 over six years. Hospitals can qualify for $2-8 million in funding. Remember, 70% of the incentive comes within the first two years. This means that in order to receive the maximum reimbursement, you must start early. There are two ways you can qualify for the incentive. Qualified providers can qualify under either incentive, but not both. You can qualify either under Medicare or Medicaid. Physicians qualifying under the Medicare portion can receive up to $44,000 and those qualifying under the Medicaid incentive can qualify for up to $64,000. You can receive your incentive payments starting in January of 2011. Physicians who do not implement EHR technology by 2015 will suffer from a 1% reduction in Medicare Payments (reductions will continue to increase after 2015 up to 5%). Providers qualifying under Medicaid are eligible for up to $63,750 over six years. Your payment is calculated as 85% of the EHR cost (up to $25,000 for the first year), and 85% of annual cost (up to $10,000) over the following five years. To qualify for the Medicaid provision, at least 30% of your cases must be attributable to Medicaid. For pediatricians, the minimum percentage of Medicaid patients is reduced to 20%. However, office-based pediatricians are only eligible to receive up to two thirds of the maximum payment. Still have some questions? Visit our frequently asked questions page for more information. Microwize periodically hosts online webinars on the stimulus package, as well as demonstrations of EMR software. To register for our next demonstration or webinar, visit our events page or click here.